With a week to go before Election Day, Americans are confident their local election authorities are up to the essential tasks of making sure that elections are run smoothly and that votes are counted accurately. Nearly nine-in-ten (89%) have confidence in poll workers in their community to do a good job, and majorities say the same about local and state election officials. In addition, a substantial majority (80%) of adults say they expect it will be very or somewhat easy for them to vote in next week’s congressional elections, though just 38% anticipate the experience will be very easy. These sentiments are notably bipartisan. For example, identical shares in both parties (69% each) say voting gives people a say in government. Yet there are deep partisan disagreements over other aspects of elections in this country, and many are centered on fundamental questions about the voting process. Perhaps the most telling partisan divisions are on how easy voting should be in the United States. Overall, two-thirds of the public (67%) says “everything possible should be done to make it easy for every citizen to vote,” while only about a third (32%) say citizens “should have to prove they want to vote” by registering in advance. More than eight-in-ten Democrats and Democratic-leaning independents (84%) say “everything possible should be done to make it easy for every citizen to vote.” By contrast, only about half of Republicans (48%) say this. A similar share of Republicans (51%) think people should have to prove they want to vote by registering ahead of time. The Republicans’ skepticism about making it easier to vote – and expanding the franchise – is seen across multiple measures in the survey. 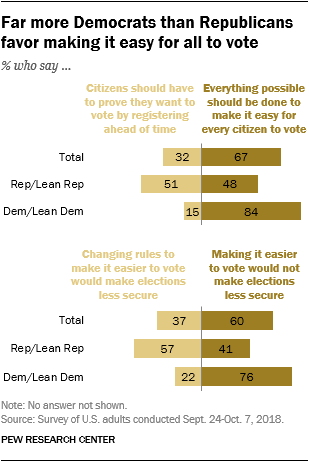 A majority of Republicans (57%) say that if election rules were changed to make it easier to register and vote, this would result in elections being less secure. Among Democrats, fewer than half as many (22%) express this view; a sizable majority of Democrats (76%) say easing election rules would not make elections less secure. These differences also are reflected in how Republicans and Democrats view proposals for changing the way people register to vote and cast ballots. 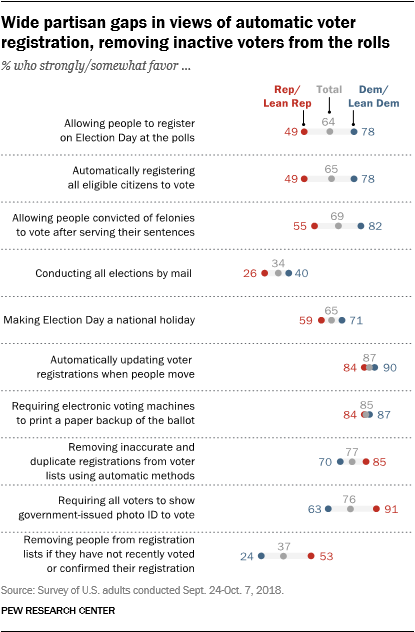 Nearly eight-in-ten Democrats favor allowing people to register to vote on Election Day at the polls and automatically registering all eligible citizens to vote (78% each). Among Republicans, only about half favor each of these proposals (49% each). The partisan gap is nearly as wide in support for allowing people convicted of felonies to vote after serving their sentences (82% of Democrats favor this, compared with 55% of Republicans). And while majorities in both parties favor using automatic methods to remove inaccurate and duplicate registrations from voter lists, Republicans are far more likely than Democrats to support removing people from voter lists if they have not recently voted or confirmed their registrations. About half of Republicans (53%) favor this, compared with 24% of Democrats. As previous surveys have found, there is broad public support (76% favor) for requiring all voters to show a government-issued photo ID to vote; Republicans are much more supportive of this than are Democrats (91% vs. 63%), though majorities in both parties support a photo-ID requirement. Some proposals for changing how voting is conducted do engender broad bipartisan backing, including automatically updating people’s voter registration when they move and requiring electronic voting machines to print a paper backup of the ballot. And majorities in both parties favor the idea of making Election Day a national holiday, though Democrats are more likely than Republicans to favor this (71% of Democrats, 59% of Republicans). Opinions on easing the voting process are linked to views of country’s ethnic diversity. 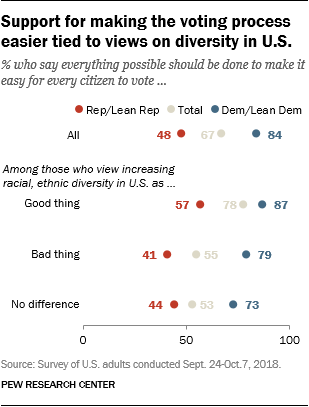 Among the roughly one-third of Republicans who say increasing racial and ethnic diversity is a good thing for the U.S., a 57% majority says everything possible should be done to make it easy for all citizens to vote. Among Republicans who view the nation’s increasing diversity negatively, or say it has no effect, fewer than half (43%) favor doing everything possible to make voting easy. 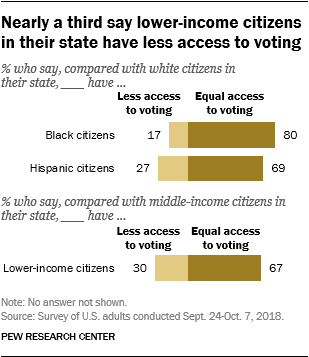 A similar gap is evident among Democrats, though large majorities who take a positive view of growing racial and ethnic diversity (87%) – and those who do not (76%) – favor doing everything to make voting easy. 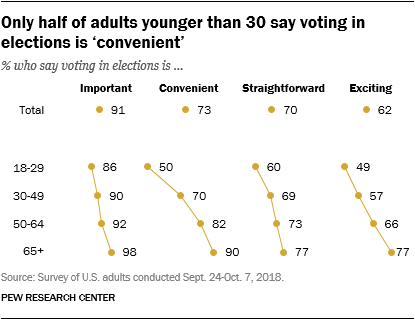 Young people are less likely to say voting is ‘convenient.’ Young people have long been less likely than older adults to vote in elections, especially midterm elections. The new survey finds that young people are more skeptical than older adults about whether voting gives people a voice in government. In addition, young people are less likely to view voting as convenient. Just 50% of adults under 30 say voting is convenient – by far the lowest share of any age group. More concern about eligible voters being prevented from voting than ineligible voters casting ballots. More people say it would be “major problem” if eligible voters are prevented from voting than if ineligible voters vote in an election. These differences hold across several hypothetical scenarios: 58% say it would be a major problem if even one voter (in an election of 1 million people) who meets all requirements is prevented from voting; 41% say it would be a major problem if one ineligible voter casts a ballot (again, in an election of 1 million). Views of parties’ commitment to fair elections. While 62% of Americans say the Democratic Party is at least somewhat committed to fair and accurate elections, just 23% say it is very committed to this objective. A narrower majority (56%) says the Republican Party is very or somewhat committed to fair and accurate elections, with 20% saying the GOP is very committed. In part, these views reflect deeply cynical views among members of both parties about the other party. Majorities of both Democrats (64%) and Republicans (56%) say the opposing party has little or no commitment to fair and accurate elections in the U.S. CORRECTION (Dec. 13, 2018): In the section “Racial differences in views of election administration,” the data for those who say they are confident in local officials and those who say they are confident in state-level officials were transposed. The section, including the chart “Nearly nine-in-ten expect workers in their communities to do a good job during the elections,” has been corrected to read that 32% are very confident in officials in their local area, 51% are somewhat confident, 12% are not too confident and 3% are not at all confident; 28% are very confident in officials in their state, 50% are somewhat confident, 18% are not too confident and 4% are not at all confident. The topline has been corrected as well.